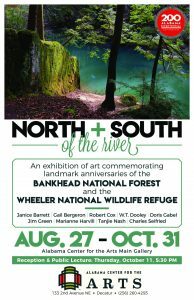 In celebration of the 100th anniversary of the Bankhead National Forest and the 80th anniversary of Wheeler National Wildlife Refuge, an art exhibit opened on August 27 in downtown Decatur, Alabama, at the Alabama Center for the Arts. The organizer of the show is Rob Cox, an original warrior for the Bankhead National Forest in the early days of the Bankhead Monitor as a volunteer and later as a board member; with Lamar Marshall, he co-founded The Talladega Monitor; after our organization’s first name change, Rob was a board member then later staff for Wild Alabama, and is a former board member of Wild South. Rob is also an exhibitor in the show. Other Wild South associations include the photography of Charles Seifried, and oil paintings and drawings by Wild South Outreach Coordinator Janice Barrett. The gallery is open Monday-Thursday, 8 a.m. – 8 p.m., and Friday, 8 a.m. – noon, and is closed on weekends.